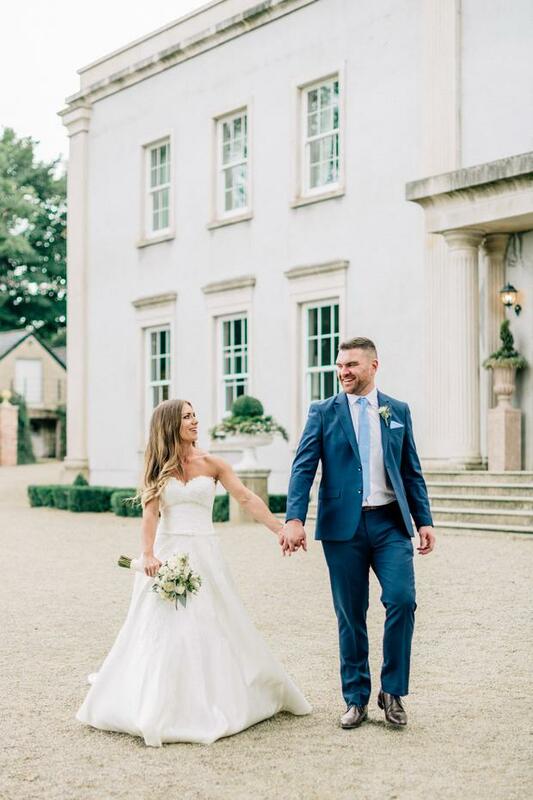 They got engaged on a cosy Christmas Eve morning at their home in Terenure five years later and set about planning their August '18 wedding celebration in the chic Clonwilliam House in Wicklow. 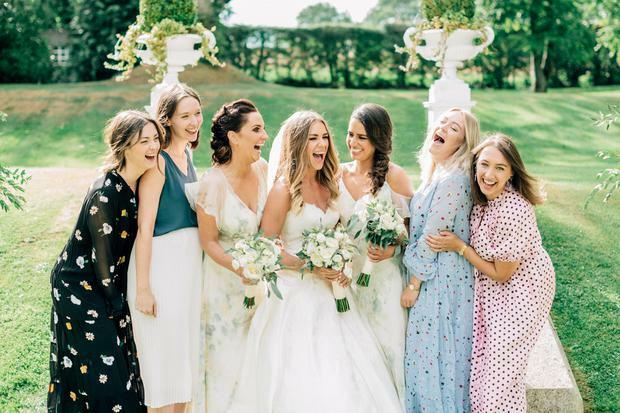 "We didn't have any specific ideas of what we wanted with the exception of the venue," says Katie, "we were both quite laid back about the whole planning process and knew we didn’t want to be consumed by it. 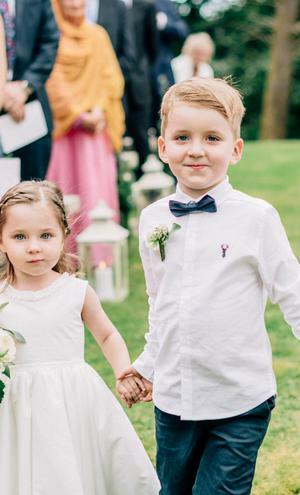 "As soon as we chose Clonwilliam, I didn’t need to worry about anything." 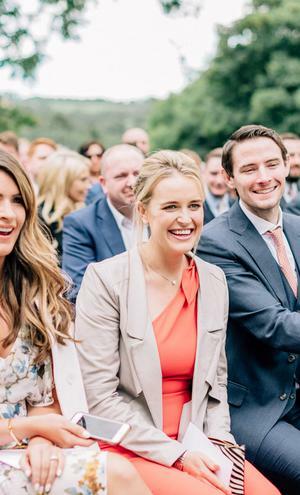 An outdoor wedding in Ireland is always risky, and the weather can make or break a day with very few alternatives on the backburner - however Katie and Robert clearly like to live life on the edge! 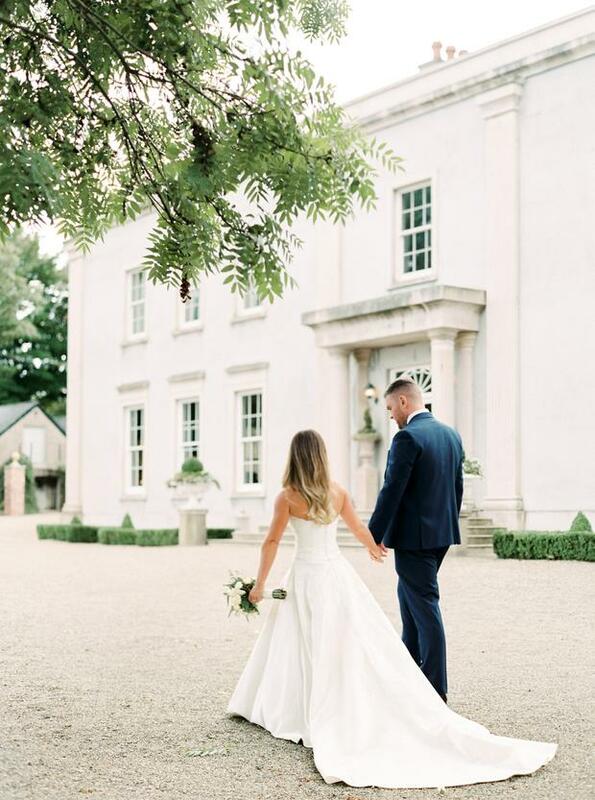 Having decided just days before to cancel their marquee and just pray for the rain to hold off, they were rewarded with a beautifully sunny, outdoor spiritual ceremony on the grounds of Clonwilliam House. The one hiccup? "Our ceremony musicians got the ceremony time wrong and didn't make it in time!" Despite one or two mishaps however, neither the bride nor the groom would change a thing about the day. "I honestly don’t think there is anything we would change, it exceeded all our expectations!" 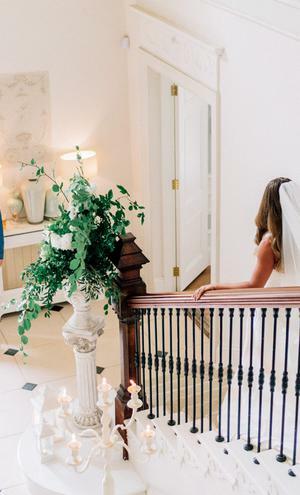 Photographer Claire Brown of Studio Brown was on hand to capture the day. Katie wore a strapless A-line gown from Pronovias, which she bought from the flagship Pronovias store in London. 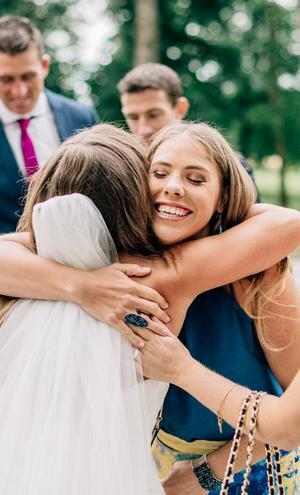 "My sister got married in June of this year so we travelled over to London twice together with our mum and both ended up finding our dresses in Pronovias," Katie explains. 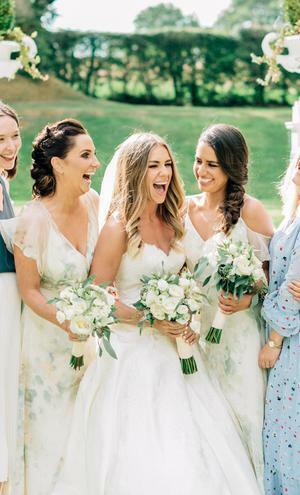 Katie admits she initially found wedding dress shopping somewhat overwhelming, and while she only technically visited one bridal store, she tried on close to 20 dresses in total. 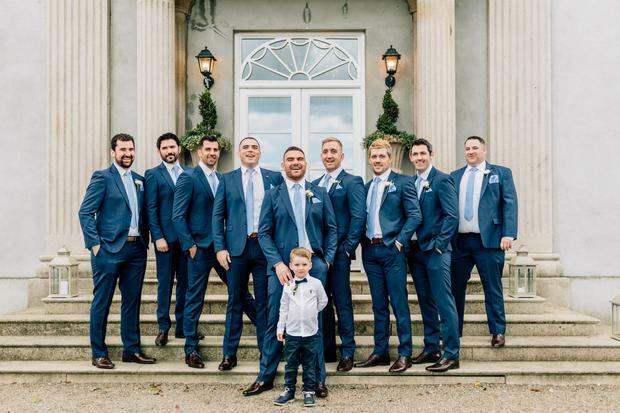 Robert and his groomsmen had a bit more of a straight-forward search for their suits, purchasing them from Protocol on Dublin's Dawson Street - "the first and only place Rob visited!" 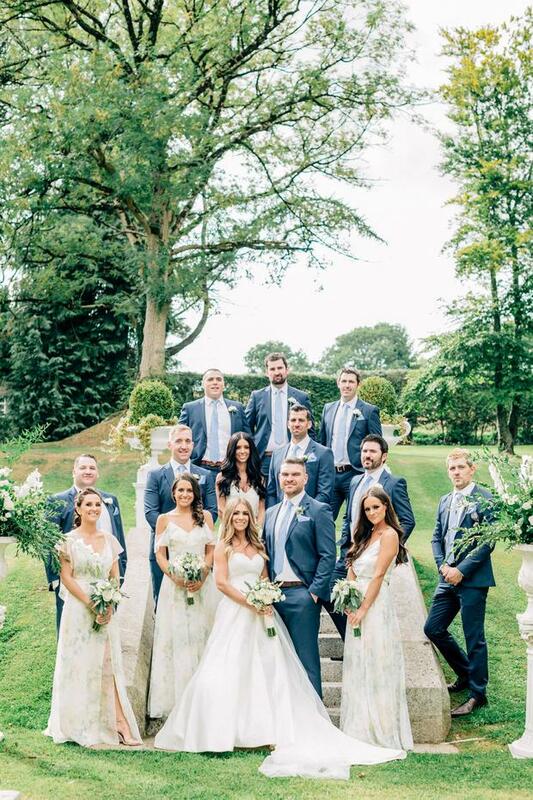 Katie's bridesmaids wore Jenny Yoo dresses in different styles, all of which were purchased from The Suite on Dublin's Drury Street. The décor at the venue was all done by Clonwilliam House. 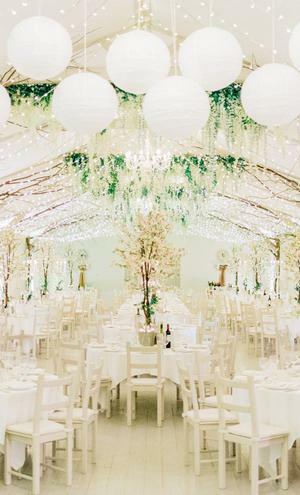 "My favourite part of the décor was the cherry blossom centre pieces on the dinner tables," says Katie. "I had mentioned this idea to Miriam [Clune, of Clonwilliam House] and she was able to arrange them for me. I loved them." 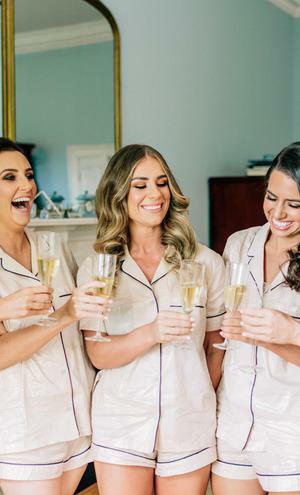 For the bride, spending the morning of the wedding getting ready with bridesmaids and family in Clonwilliam House's beautiful bridal suite was a particularly perfect start to the day. 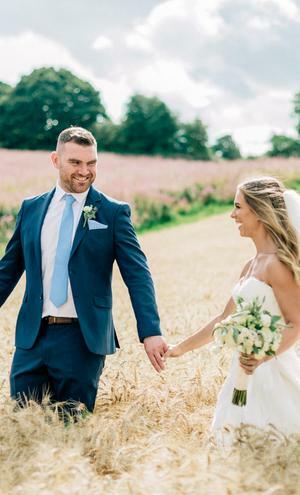 The couple used catering company Naomi's Kitchen for their wedding food, who delivered an incredible feast for all from afternoon to night. 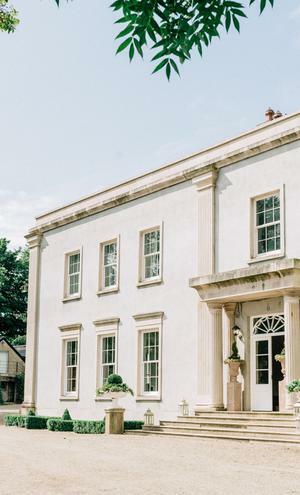 At their drinks reception they served a selection of canapes including Irish salmon pâté on homemade Guinness rounds, mini gourmet hamburgers and goat’s cheese frittata, while the drinks on offer were caipirinha, prosecco and Archway beer. For starters at the main meal, guests were served an antipasti board with a selection of Mediterranean cheeses, homemade basil pesto, hummus, grissini and ciabatta. Main course was fillet of Irish beef with green peppercorn cream, served with pomme puree, sweet potato crisp and organic pea shoots. Dessert was a French pear and almond slice. For evening food guests were treated to homemade gourmet sausage rolls with Naomi's Kitchen spiced apple and tomato chutney which were served up at midnight. "As cliché as it sounds," says Katie, "enjoy every moment as it goes by so fast and try not to stress out about the little things as you won't even notice them on the day." Katie and Rob spent a week in Spain after the wedding and plan to travel to Bali early in the new year.